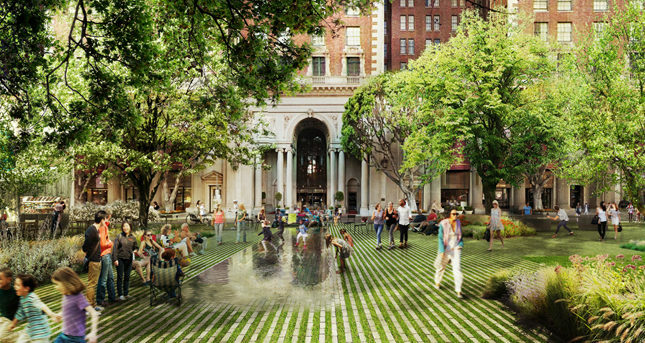 Agence Ter was selected this morning as the winners of the competition aimed at redesigning Downtown Los Angeles’s central, 5-acre park, Pershing Square. 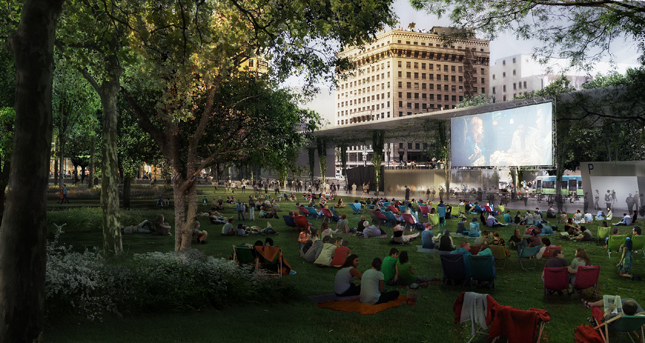 The firm’s proposal for the city’s most historic open space aims to “get rid of trendy design approaches” that have plagued the park’s prior redesigns and to provide, as Agence Ter partner Henri Bava declared at the announcement ceremony, a “timeless design able to change with the neighborhood.” The French landscape firm’s approach is notable for the “town square” approach taken to the site, where a large canopy located at the western edge of the park will house cafés and other amenities that open onto a grassy knoll at the center of the park. Agence Ter’s proposal beat out entries by James Corner Field Operations with Fredrick Fischer and Partners, SWA and Morphosis, and wHY and Civitas. Bava announced that the agency would open a Los Angeles office to oversee the design and construction of the park. 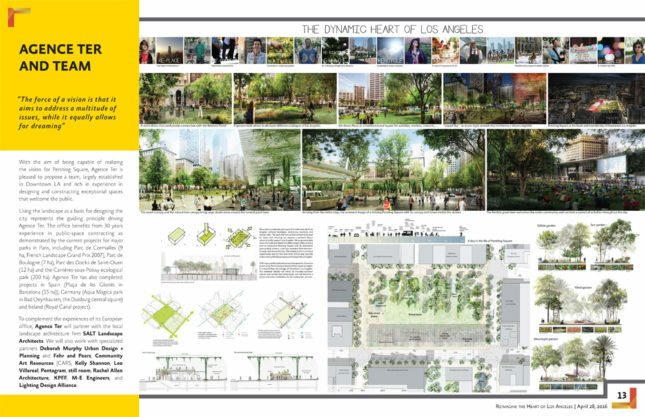 The four finalists were selected in December 2015 from an original pool of ten groups that presented work to Pershing Square Renew, a nonprofit partnership between Huizar and business leaders, residents, and activists administering the redesign. Those four teams presented final schemes to the public in late April. In the three weeks since, politicians, business people, and residents have provided input via public and online forums made available for comment. Agence Ter’s proposal was selected at the conclusion of this semi-public vetting process. 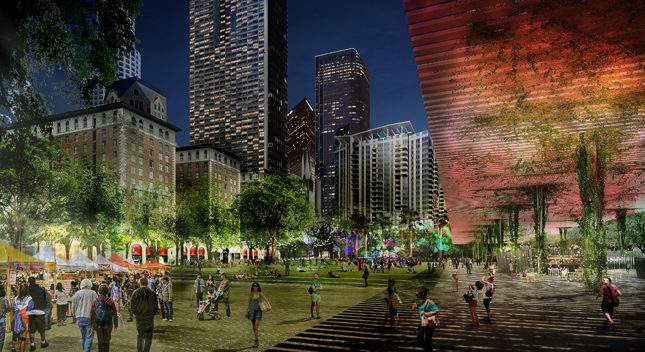 The city’s oldest park, Pershing Square has lived through many iterations and names throughout its 150 plus year history. 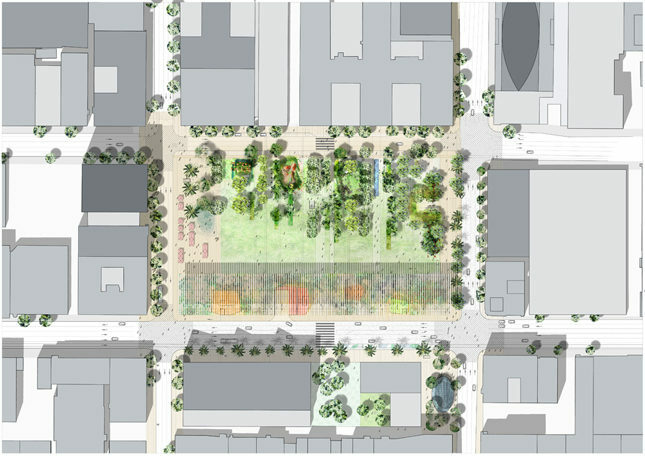 The winning proposal will be the third such iteration for the square in the last 100 years. The most recent version of the park was designed in 1994 Mexican Modernist architect Ricardo Legorreta. Laurie Olin was the landscape architect while Barbara McCarren designed the site’s hardscaping. A disciple of Luis Barragán, Legorreta’s scheme for the park takes a coy approach to the plaza mayor concept by using brightly-painted platonic stucco masses to frame and divide the area programmatically. These spaces include a purple campanile, small café area, seating integrated with expanses of lawn, and a large fountain surrounded by sculptural orbs. The park sits above a city-owned, five-story parking complex and has been generally unloved by the public because of it’s lack of porosity and the physical impediments resulting from the garage’s many access ramps. The rapid fire progress seen on the redevelopment of the park, a process that began only in 2013, has mirrored the transformation of the area from run-down business district to affluent enclave. A Ralphs supermarket opened in the area in 2007, the first in over 50 years. That market catalyzed a residential boom in the area and since then, Ace and Standard hotel locations have come on line, bringing with them a slew of high-end culinary and retail establishments, including a 42,000 square foot Whole Foods location that opened in November of 2015. The winning scheme, if built and ultimately successful, would cement Downtown L.A.’s status as one of the city’s distinct and vital neighborhoods. As of this morning’s announcement, however, no budget for the redevelopment has been released and a timeline for the construction of the project is still to be decided. Councilperson Huizar expressed hope that the park would be open by 2019, he and other City officials and residents are joined in their hope that this version of the park will be the one that finally sticks. Hopefully Agence Ter’s scheme won’t be wiped away twenty years from now like Legorreta’s.